Pakistan is home to many significant archaeological sites, harbouring artifacts from some of the world’s earliest civilizations. Several of these important sites, however, have fallen victim to corruption, vandalism, and neglect in recent years, posing a very real threat to the most storied aspects of the country’s cultural heritage. The failure to properly administer excavations at some of such archaeological sites has recently been brought into the spotlight with the February 15, 2019 arrest of Dr. Abdul Samad, longstanding Director of Archaeology and Museums of the Khyber Pakhtunkhwa province, on charges of corruption and misuse of authority. This development has not been the only recent arrest by Pakistan’s National Accountability Bureau (NAB) in efforts attempting to counter actions perceived as corrupt misuses of power for financial personal gain. The NAB alleged that Samad had made appointments at various archaeological sites which violated accountability rules put into place by the bureau. The arrest and charges mounted against Samad were met with criticism from many Pakistani elites and academics. In his Tweet, Prime Minister Imran Khan denounced Sahad’s arrest and subsequent trial as a “disgraceful act,” referencing Sahad’s qualifications as a holder of a foreign Ph.D., former Fulbright scholar, and award-winning archaeologist. Furthermore, there have been suggestions that the illegal appointments of workers on several archaeological sites made by Sahad were fuelled by good intentions; it is possible that they were made in an attempt to deter the illegal excavation activities that are common in the region. According to the NAB, however, the appointments were only the beginning of Sahad’s wrongdoings. There have been further allegations that important, expensive artifacts have gone “missing” under his supervision. These charges, in particular, are indicative of a larger problem surrounding the manner in which Pakistani authorities have historically handled and perceived the preservation of notable cultural artifacts. Whether or not Sahad himself has been complicit in the illegal trade of artifacts, cases of antiquities being smuggled out of the country and sold for enormous profit on the European black market are far from uncommon, exacerbating the threat of the loss of cultural heritage caused by the movement of artifacts. In addition to the myriad of misappropriation cases, the legal movement of artifacts within the country has often been treated somewhat haphazardly by the governmental officials controlling the transactions; in the past, little emphasis has been placed on ensuring that artifacts remain near their historic positions, resulting in the dissociation of relics from their places of origin. A collection of over 1,000 genuine relics, mainly from sites in the province of Balochistan, were confiscated and rescued from an attempt to smuggle them abroad. Some artifacts in the lot have been dated to as far back as 2000 BCE; the loss of items so deeply rooted in the heritage of Pakistan robs the people of pieces of history that have been contained there for millennia, often for the personal gain of outsiders. While this particular attempt was unsuccessful, the problem has shown few signs of ameliorating since. It is estimated that artifacts worth billions of dollars have disappeared within the last five years. Regulators within the NAB largely blame officials such as Sahad for these cases, hence his arrest. Despite recent actions against those accused of participating in illegal activities that threaten Pakistan’s archaeological heritage, the fact that the government has not historically enacted measures with a clear focus on protecting the sites suggests that the arrests are more of a calculated political move than representative of a sudden concern for the protection of the country’s history. Indeed, throughout the focus on misappropriation and corruption among archaeological administrators in some high-profile areas, other places of interest throughout Pakistan have been left to decay as the government indifferently looks away. The situation is better in some provinces than others; the site of Taxila, in the province of Punjab, has been recognized as a UNESCO World Heritage Site and, as such, has been the focus of strong protection, preservation, and restoration efforts in recent years. Although recent successes in Punjab project a positive image of the government’s involvement with the preservation of cultural heritage—and possibly because government resources have so heavily been allocated towards Taxila over other archaeological projects—sites elsewhere in Pakistan are in as dire of a condition as ever. This phenomenon is exemplified by the current dismal state of sites whose origins can be traced back to the Mehrgarh civilization in the province of Balochistan. The Mehrgarh site was one of Asia’s earliest farming villages, established as early as 7000 BCE. It subsequently grew into a significant settlement and is considered to have been a direct precursor to the highly sophisticated Indus Valley Civilization, some customs of which continue to persist in the region. As such, there are direct links between Mehrgarh culture and present-day Pakistan. The artifacts contained in the site crucially link the land’s current inhabitants to those who first inhabited it thousands of years ago. Protecting such pieces thus equates to protecting Pakistani heritage. Contrary to the success story of Taxila, due to a lack of government support for its candidature, Mehrgarh has not achieved World Heritage Site status despite being evaluated by UNESCO. Lacking the protection that the World Heritage Site denomination brings (requiring governments to remain accountable for the ongoing maintenance of such sites), the area has not been sufficiently preserved. Since excavation activities came to a halt in 2000, the site has been left entirely at the mercy of the elements and of vandals; even basic maintenance and protection operations have not been put in place. Had it achieved World Heritage Site status, this level of negligence would have been entirely unacceptable per UNESCO’s World Heritage Convention (to which Pakistan is a State Party). 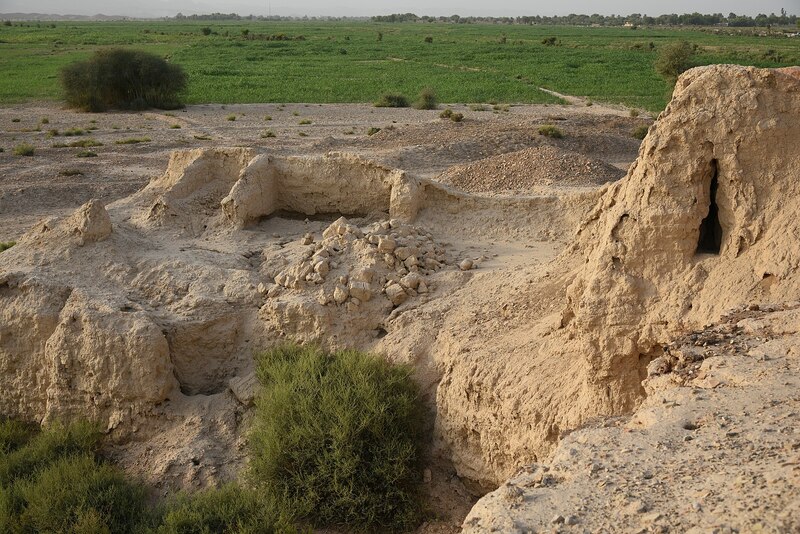 The lack of even a wall to separate the excavation area from its surroundings is indicative of the complete disregard the government displays towards Mehrgarh and similar sites, facilitated by the lack of accountability. Without government recognition and protection of the potential of noteworthy discoveries that Mehrgarh presents, environmental factors are not the only threat. A recent walk held to raise awareness and encourage preservation of the site was attended by people of various backgrounds, and it was organized and broadly attended by notable academic and public figures condemning the lack of government action. The point of frustration for such elites is the lack of governmental and popular recognition of the importance of Mehrgarh and the artifacts it houses, despite their own efforts to emphasize its cultural significance. Normal citizens have little knowledge of the importance of the artifacts scattered across the unprotected site and commonly sell them for personal profit. Awareness would not likely deter this process, especially in Balochistan, the province with Pakistan’s highest rural poverty rate. Smuggled antiquities can sometimes be recovered, but their loss still tragically detracts from the area’s history. Unfortunately, other factors threatening Mehrgarh and many other archaeological places of interest in Pakistan can render antiques irreparable. Vandalism is one of the largest menaces affecting the preservation of Mehrgarh. While simple destruction enacted by individuals does occur, the most disastrous instances have been due to the political strife common in Balochistan. The entire site has been razed due to a tribal feud, hindering the last excavation attempts in the early 2000s. Sherds of pottery and other rubble remain strewn across the ground at the site, with no restoration attempts on the horizon. Mehrgarh is not the only place of interest in Balochistan—and in Pakistan at large—that has not been appropriately preserved. While corruption cases such as that of Sahad can broadcast a threatening message from the government, they do not fully attack the problem of priceless artifacts and pieces of Pakistan’s distant history that are in danger of being lost forever.